Even though we’re 6 months ahead of the lunar new year in February 14, 2010, these dishes, especially banh day are often eaten year round. Sandwich a piece of fried cha lua (Vietnamese ham) and it becomes a Vietnamese “hamburger” that’s surprisingly tasty and brings back great memories eating this growing up. Cha lua can be found in most Asian groceries either wrapped in aluminum foil or banana leaf. Add salt and rice flour to mixing bowl and mix. Slowly incorporate the water into the dough and work it into a ball. Keep on working it and be patient, it will come together! The dough should be like play dough in texture. Brush a light layer of oil on top side of the banana leaves or aluminum foil. 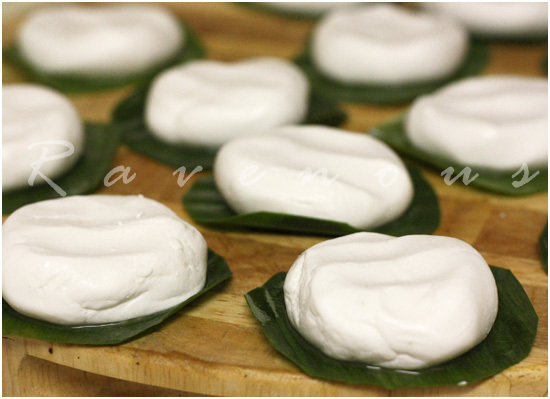 Pinch off a small piece of dough and roll into a small ball slightly smaller then the size of a golf ball and place on banana leaf. Gently flatten just a bit, but not too much as it will flatten further when cooked. Place in steamer tray with plenty of space between as these will expand. With a boiling steamer, steam for about 8 minutes until completely opaque. Over steaming will cause it to flatten. Remove and allow to cool about 10 minutes or so and serve with slice of cha lua. To store, brush on another thin layer of oil on top of one rice cake and then flip another rice cake on top so that the banana leaves are on both ends. Wrap with saran wrap. This stores in the fridge for about a week. Reheat in the microwave for about 45 secs. Stick a piece of cha lua (Vietnamese ham) inside and it’s simple but yet tasty and even addicting snack. Some even dip this in fish sauce. 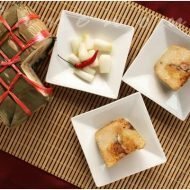 The soft and sticky glutinous rice cake celebrates the simplicity and importance of rice in Vietnamese culture and is a treat fit for both Kings and commoners. This is simply amazing!! 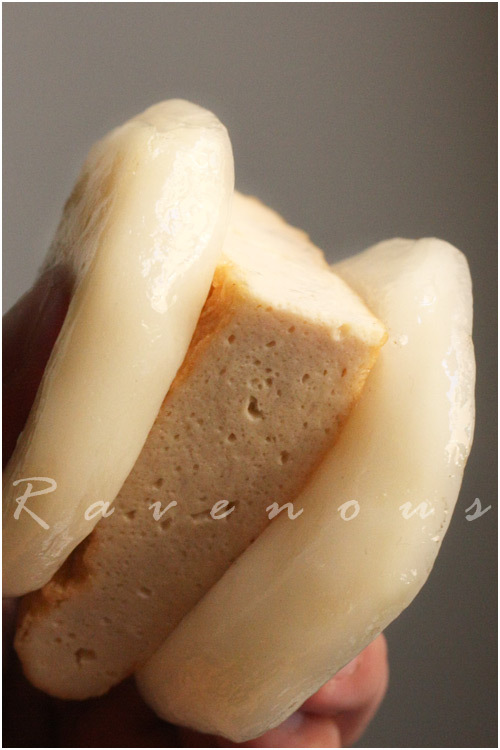 Would love to try this Vietnamese rice cake one day! This is one of my fav childhood dish. I ate it a lot. Mom just bought it from the market for me. My grandmom made it sometimes using the traditional way but it was a loy of work. I will try yours!! Thanks! kennyT: Banh day's amazingness is in it's simplicity! Anh: Banh day was a great snack after school or for lunch growing up. 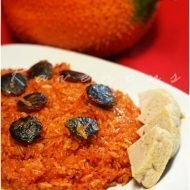 I love your post with the story or history of the dish. I especially like the one about trau cau. this is one of my favorite snacks! my mom and grandma used to make it all the time when i was little, except with only one of the rice cakes- which i seem to like a lot better! not so doughy and you can enjoy the cha lua better! natalie: you're right! you can use one rice cake. Since it's so pliable, I liked to wrap the single rice cake around the cha lua. What a thoughtful and informative post! I love the rich historical context you've added. I like any recipe that features cha lua, especially with banana leaves. You guys are incredibly talented, and I have much admiration. christine: thank you so much! Oh lord, I love banh day! Sometimes I eat it too quickly and choke on the sticky dough. Good times. Gastronomer: you're hilarious! probably too plain for bake sale huh? H.C.: thanks for stopping by! lovely blog (and thanks for visiting.) I have never had this and I can't quite imagine the flavor but from your picts it sure looks appealing. What a great story. When I have to come up with a winning recipe, I'll have to remember to sleep and dream one up. Now, I want a vietnamese "hamburger". Yum. my mom just made some of these the other day. since we arent so close to a asian grocery store that has banana leaves, we use heavy duty aluminum foil oiled. so good though. i wish my mom could make some banh cuon though. jackie: wow, we're surpised you never had this..try it sometimes! bluag3lbby: using aluminum foil works just fine as well. Hang: try it and let us know how it goes! Nothing stops a women and her food cravings.. Thanks for visiting and hope you comment often. Oh, these look good, and I have all the ingredients. Thank you for sharing the sweet story. How wonderful to learn about this specialty, it sounds amazing! I would love to try! wow very informative. I've never heard of this before, sounds really tasty. Hang: Thank you for sharing that great story! We're so glad you and your daughter enjoyed the banh day. 5 star foodie, Little Teochow, pigspigscorner: big thank you to all of you! This one is a bookmarker! Thanks for the recipe. Looks incredible. Wow…it's been such a while since I last had these! 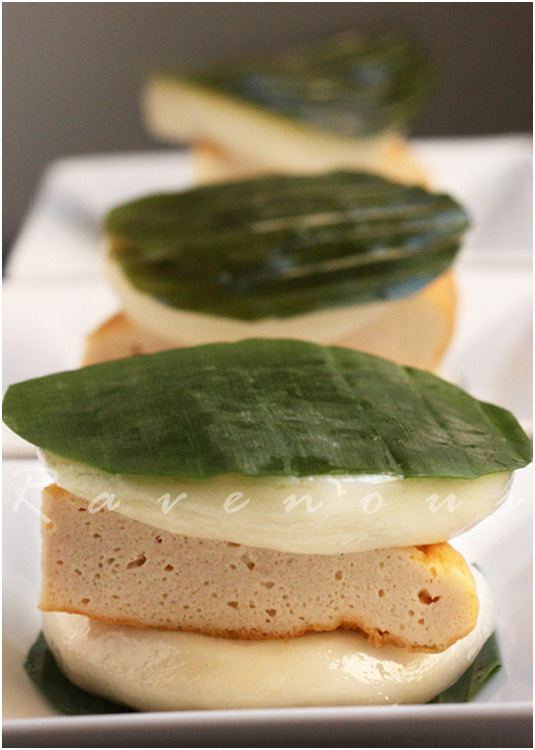 These "rice cake" represents a true Vietnamese culture/ culinary, I think. BUT, I don't like them PERIOD!!! I do, however, enjoy the sweet and earthy fragrant from the "rice cake" but other than that, I often told my mother, who absolutely LOVES these, that eating "banh day is like eating a big chunk of tasteless, favorless, senseless rice dough…"! I'm just glad you make these at home! What if you don't have a steamer? Are there other alternatives? LaLa: Yes, you can buy these metal platforms at your Asian market that you place inside of pots to create a steamer. They have all types of sizes and are only a few dollars each. I really love learning about the history behind food, thank you so much for sharing! 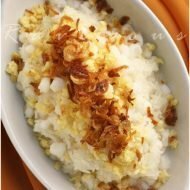 Your banh day look so simple and pure. This is absolutely awesome recipe. Also this is new recipe for me. Thank u.
Wow! This is really something so cool! I am starting to love it with all the photos. I can't wait to try this one. It made so much sense after that haha! Love all your recipes! Can I use a hand mixer for this recipe or do I need a Kitchen Aid standing mixer to mix the dough? Thanks! Thank you so much for this recipe. Could you please let me know 1 cup of water is equivalent with how many “ml” ?